Yes, we finally moved our entire home into another, closed on both properties and now settling in to this new chapter of my life. I had to take some time off from blogging and everything internet for a while because my head was just a bit too full to do otherwise. 1. Obviously, THE MOVE. All I can suggest is breathe, get rest, ask for help, breathe, don’t settle, yell if you need to, cry, laugh and it will all be worth it. And every single part of your body will ache, not to mention the horrible condition of my hands. 2. What have I been reading? Music For Wartime by Rebecca Makkai has been a steady constant. The short story collection is wonderfully unique and I’m not rushing through them. Black River by S. M. Hulse is incredible! I can’t recommend it enough for those of you who like dark and gritty but will tear at your heart. (Review tomorrow) I just started The Winter People by Jennifer McMahon. It’s been on my TBR for some time and every time I walked by it at the library, I swear it was stalking me. Perfect for this time of year. It’s a creepy ghost story that will make your hair stand on end. I also picked up Rogues which is a collection of shorts simply for “What Do You Do” by Gillian Flynn. Her story is coming out retitled as “The Grownup” on October 27th as a single short book but I couldn’t wait. 3. I’ve been watching A LOT of T.V. The Good Wife is in season 7 and I’m a bit behind but I’m sticking with it when I would normally give up. Homeland is in season 5 and again, I’m sticking it out to see Carrie get crazy…again. The Affair is only on season 2 and I love the “he said, she said” storyline. This season we get to hear from the spouses. And there’s Pacey Witter 😉 Call the Midwife is my absolute favorite after being recommended by my coworker. Obsessed is more like it. Season 4 just came out on Netflix and it is based on the memoirs of Jennifer Worth. I’ve read a few of them but dare I say that the adaptation is better? More heart. I swear I cry at every episode but end with a huge dorky smile on my face. I just started Broad City and had to find the DVDs at the library after trying to watch them online. How can you watch an episode without 25 ads??!! Anyone? 4. I’m working on my ESL endorsement and it’s so interesting and right up my alley: linguistics, language acquisition and cultures. We recently had an assignment to list some new words NOT in Merriam-Webster that should be and I’m sorry to report that I am behind on my new lingo. We also had to discuss how culture changes language and I referenced “pop culture” and enjoyed reliving some of these “Seinfeld-isms” that are used frequently today. Even my kids “Yada-yada” their day. 5. 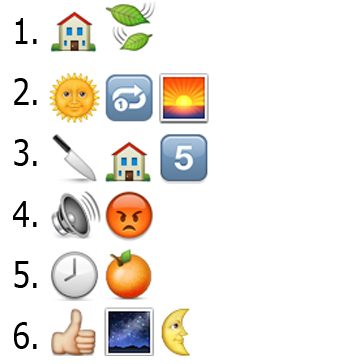 Have you seen book titles as emojis? So fun and I’m trying to incorporate them in a display at the library. Here is one from the site Apple Snacks Magazine. Click on the link for the answers. 6. 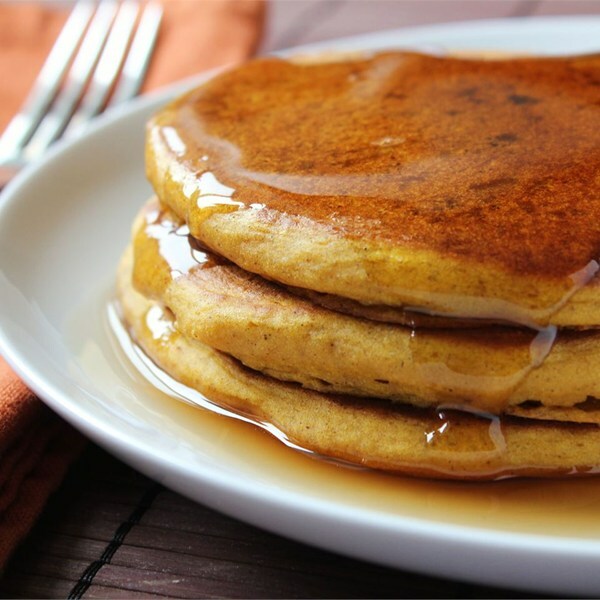 I made these Pumpkin Pancakes and they were delicious! I posted the recipe on the blog when I first started blogging and used to add recipes from time to time, so I’m bringing it back. The original recipe is here from Allrecipes.com. Well, six is all I can muster today. I’m glad to be settling in and to hunker down with some great books this week. What have you been up to and reading? Tags: book title emojis, bookish and not so bookish thoughts meme, ghost stories, grit lit, pumpkin pancakes, Seinfeld-isms, short stories, Thrillers, tv series. Bookmark the permalink. Oooh – Black River sounds interesting! Dark and gritty seems to have been my thing this year! And – I’ve heard great things about Makkai as well. I’m so into The Affair – it’s hypnotizing in a way and I’m so interested to see where they take things!